the column with notifications from Tweetdeck dissapears. Note that on step 5 I'm on a different page and am redirected to TweetDeck afterwards. This forces a full page reload which is likely masking the issue for me as you mentioned reloading fixes the issue. I'm using Chrome 69 on macOS, with 1Password X 1.11.1. The column that you just interacted with will dissapear. Here is an example I just screenshotted: my notifications column is empty, and hitting 'back to notifications' doesn't do anything. I just need to reload Tweetdeck before the column starts working again. 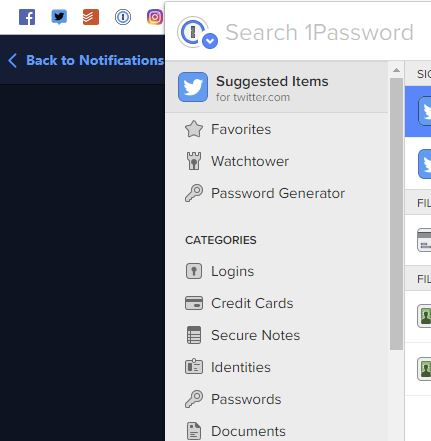 Didn't you already unlock 1Password X and login to your Twitter account on or around step 2? It may be that doesn't matter, and something changed with recent updates though. Can you clarify and/or confirm? Thanks in advance! @brenty I'm already logged into Tweetdeck. So I'm just unlocking 1Password X, with Tweetdeck open. @yokk: Hey, I'm sure the confusion is my own in this case. Thanks for bearing with me. Your description was very helpful, and I also think that me already being signed in now helped too. 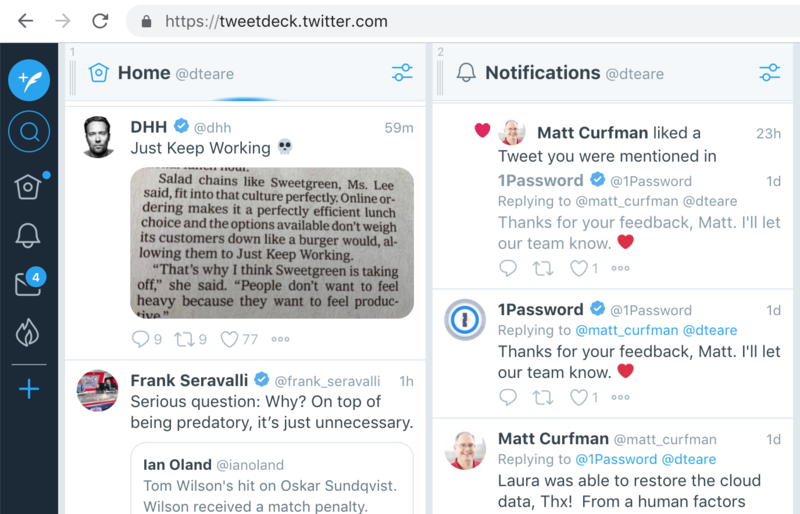 Actually, I think my Tweetdeck ineptitude came in handy here: it turns out that I not only see what you mean, but I accidentally did the opposite — locked 1Password X after interacting with Notifications — and found that has the same result: the column disappeared, and now I can't seem to do anything with it. So definitely related to locking somehow. I've filed a bug report for this so we can take a closer look and see what can be done. Again, thanks for reporting this, and walking me through it! Indeed, we have not found a solution for this yet. Sorry I don't have better news for you. Likewise, thanks for the nudge. Hopefully we'll come up with something, and it will just start working for you one day, thanks to automatic updates.